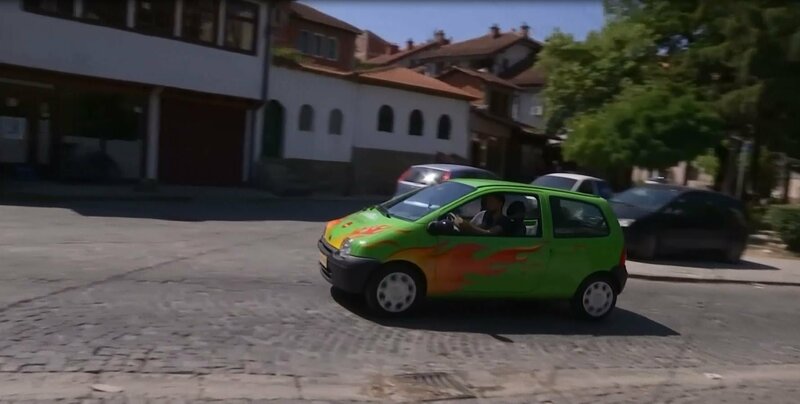 A team of teenagers from Kosovo has converted a regular gasoline powered car into a fully electric vehicle. They were given support from a non-profit organisation that challenges young people to think big and discover their talents. With a turn of the key, this electric car heads off on it's maiden voyage through the town of Gjakova about 80 kilometres west of Kosovo's capital Pristina. The Renault Twingo has been converted from a gas-guzzler into a green machine, running entirely on batteries. It's taken a group of six teenagers - aged 15 to 17 - months of hard work to get the car ready. They stripped it back and replaced the engine with rechargeable batteries. But none of them could do the driving honours as they aren't old enough to get a driving licence. Dion Doli is a 16 year old member of the team who built the car and says they faced many challenges. "This electric vehicle is a Renault Twingo and it is made completely out of 6 teenagers and a manager that is Nathan Troll. During this project we had many problems but we divided the process in two stages. In the first stage we learned, we studied, we read a lot and we prepared ourselves for the time being when we were going to do everything in the car. And in the second stage when we were doing everything, we're mounting everything in the car we had most of our problems but with teamwork, with ambition and commitment with did what you can see today." They built the electric car to encourage the local community to use more environmental friendly vehicles and to show them what can be achieved. "This car can go up to 120 kilometres per hour at top speed it can go at 70 kilometres of range and it takes about 3 hours to charge that is slow charging but we are willing to make it with fast-charging which is approximately one hour," says Doli. The students say there's been a lot of interest from locals. "Every other two people that saw as working in and making this car said: 'when you are finished will you make another car for me?' Because we told them that its economy is cheap doesn't make noise and it's very good, environmentally," says Doli. Arber Lleshi is executive director of BONEVET and says they provide mentors to encourage hands on experience. "The purpose of "BONEVET" is to offer courses, training and to offer capacities for the youngsters to discover their talents and learn new skills, it is like to orientate them in being (a) better person, being more curious or being more creative of unleashing their imagination and asking question be critic of what ever they have felt for," he says. BONEVET began operating three years ago and is running several different projects. "Our major project until now is of course the electric vehicle but our youngsters have made a lot of 3D printing, prosthetic hands of course, they made 3D printers ourselves. We have three 3D printers created here, we have a CNC machine and we are going to have a lot of medium scale projects and a lot of national and international awards for these projects," says Lleshi. Doli says participants also learn how to work in a team and to work with people with different levels of skill and experience. He says BONEVET wants to nurture a vibrant community of ideas and resource sharing among its makers, which it hopes will foster character building traits like grit, creativity, open-mindedness and social responsibility. At the Cultural Park "Ali Podrimja"
The first electric car is introduced here before us! Come see closely the technological sensation! - attending Kosovo with the first electric car at the Ali Podrimja Cultural Park.